If you are looking for a WordPress plugin to password protect your website content, you are in the right place. With “Password Protect WordPress” plugin, you can create and manage multiple passwords for each WordPress page and post with ease. What’s the difference between WordPress “Password Protected” and “Password Protect WordPress” plugin? 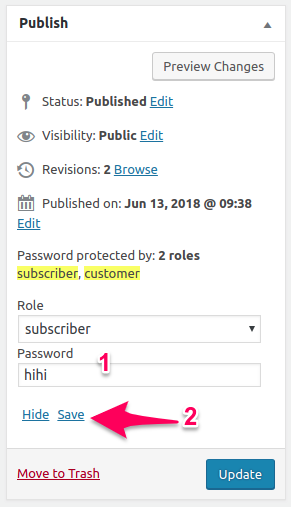 WordPress default “Password Protected” feature only allows you to create one password which applies to all visitors and users of your website. That means even admins have to enter the same password to view the content. On the other hand, Password Protect WordPress plugin allows you to set not only multiple passwords for all user roles but also a different password for each and every user role. In other words, you can set one password for your contributors, one for your subscribers and so on. It comes in handy when you want to block certain user roles from accessing your content, you just need to deactivate or delete the password for that role. The other user roles will not be affected. How to password protect against specific user roles? Simply leave the password field empty to remove a password for a particular user role. You can continue setting a password for another user role without having to refresh the page. How to protect WordPress pages & posts with multiple passwords? By default, once password protected, a new password is generated automatically for you. Besides, you’re able to create as many passwords as you want for each page or post by clicking on “Auto-generate new password”. How to manage all your passwords? Locate your protected post or page under WordPress Pages or Posts then click on “Manage passwords”. Once clicked, a popup appears allowing you to manage all your passwords. First and foremost, we integrate WordPress “password protected”, our own “password protect by role” feature into the popup for you to manage all your passwords at the same place. You will see every user role assigned to each password under the “Type” column. What’s more, you can view the number of times a password has been used to successfully access your page/post under “Total Usage”. Last but not least, you can deactivate/activate or simply delete any passwords that you want through these icons. Please note that when you unprotect your page/post, your passwords will be hidden but not actually be deleted. When you password protect your content again, these passwords will show up as previously. “Password Protect WordPress” also helps you to auto-protect all posts under a category as well as child pages under a parent’s. For example, you just need to protect the parent page, all its child pages will be auto protected. And when users access your child page, they have to enter parent page password. With Password Protect WordPress plugin, it has never been easier to password protect your pages and posts even if you are new to WordPress.